Locomotive #6218, the last engine to be repaired at the Motive Power Shops in Stratford, has been brilliantly recreated by the students and teachers at Off the Wall's workshop "Setting the Scene"! 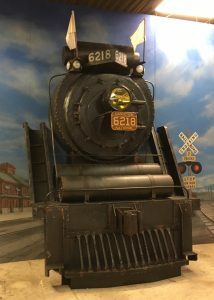 Set against the background of Stratford's main train station and rail yard, this is a striking addition to the museum's exhibit "Railway Century", which chronicles the history of the Shops and the influence of the railway on Perth County. Railway Century, a permanent exhibit at the Stratford Perth Museum, is made possible thanks to generous support from Via Rail.